The celestial body – named Oumuamua – was scanned for radio signals after its shape led researchers to consider the possibility it could be an alien starship.But an international team of researchers from the French National Research Council, the University of Bordeaux and NASA’s Goddard Space Flight Centre say initial data suggests its definitely not an alien object. 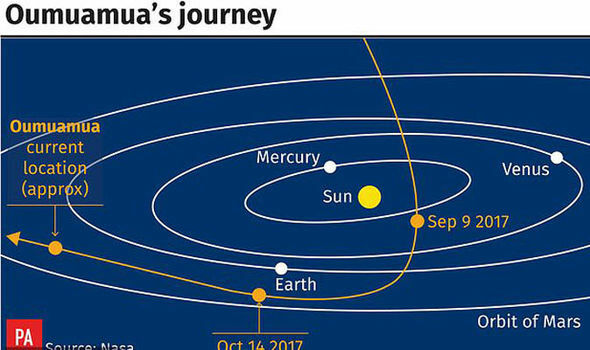 Astronomers from the University of Hawaii first spotted Oumuamua – named after the Hawaiian term for “scout” or “messenger” – on October 19, 2017, passing the Earth at about 85 times the distance to the moon. It was the first object discovered in the solar system that appears to have originated from another part of the galaxy. French researchers, led by Sean Raymond, believe its bizarre cigar shape could be due to its origins because Oumuamua would have originally been a comet in formation. Mr Raymond suggests that Oumuamua could be one of those primordial celestial objects that are created by aggregation of grains of dust around young stars. He explains that during the process of formation of asteroids, comets and planets, use the gravitational force of a gas giant similar to Jupiter, which would have crushed it and finally expelled it from the planetary system. Hence its long and thin shape. Reseacher, Maria Cristina De Sanctis, of the National Institute of Astrophysics said it is probable that Oumuamua was originally from the comet family and not an asteroid. She said: “The fact that it does not have the typical comet’s hair does not mean anything because if it passed near a star it could have run out of the ice that covered it and that’s the reason for the comet’s bright hair. “It was expected to be an object similar to a comet, but when Oumuamua arrived in the Solar System, researchers realised that it did not emit dust or ice and therefore it was not a comet, but an asteroid”. Although thought to be an asteroid, Oumuamua’s elongated cigar shape hundreds of metres in length but only one tenth as wide is highly unusual for a typical space rock.Travelling at up to 196,000 mph, the object’s high speed also suggests that it is not gravitationally bound to the sun but is destined to head back out of the solar system. However, its arrival could provide experts with new and valuable information on how planets, asteroids and comets are born. Meanwhile, the mysterious object was also studied by the Seti project Breakthrough Listen, last year.